Just got my two 100mA retro-look panel meters! I will use them for A one valve CW transmitter. The valve is an ECL82 / 6BM8. 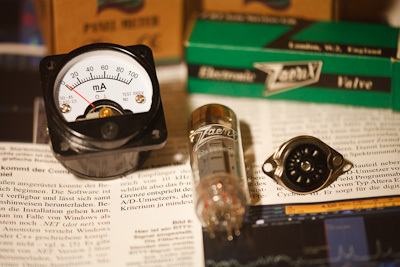 A triode plus pentode. The transmitter will work on two bands. 80m and 40m. Used crystals 3560 kHz and 7030 kHz. Power out should be somewhere between 5 and 8 Watts. Hope to start working on this project soon! I only need some not to large variable air capacitors. From an old tube radio?